If you really want to get some insight into the way Charles thinks about hackers, read The Hacker Manifesto. In that respect, Charles created New Bern Live and he’s connected people from all walks of life. It’s a terrific opportunity to listen to other people’s perspectives and learn from each other! If your device is being hacked, Charles can help you! His ideal clients are general consumers wondering if their technology is working, whether they’re being attacked and how best to control it. Charles is a down to earth family man who loves what he does. I had to ask him why hackers are portrayed on television and movies as so-called geeks. He had a great answer. “People make a lot of assumptions about hackers, but they also make a lot of assumptions about others in general. A while ago, I posted a photo of my tribe (his family) on Facebook all wearing their hoodies. Assumptions were made of a criminal enterprise.” Charles explained, “Because some people have the idea that if you’re wearing a hoody, you’re a bad person”. The truth is they’re wearing hoodies because they’re comfortable. I wear hoodies and to my knowledge, people haven’t made that assumption about me, but then again I’m a short white female in my 50’s. What kind of bias/stereotype are we dealing with? Another thing you may not know about Charles is he’s a tough guy with a big heart! He’s an Army Veteran. His MOS was a Missile Defense Crew Member. 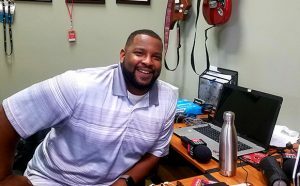 Charles has been graciously hosting New Bern Now’s Podcast for seven months and airs the show to New Bern’s News Talk Radio Station WNOS 103.9FM and 1450AM. We all have a message and New Bern Live is a great way to produce quality content to reach locals! Join me, New Bern Now, and New Bern Live in getting to know each other as people. Tune in on Tendell Tuesday for The Charles Tendell Show to find out the latest cyber security threats and much more, as you never know where the conversation will lead! Visit The Charles Tendell Studio in Suite 107 of the O’Marks Building, 233 Middle St. in Downtown New Bern or call 252-631-0139. Thank you, Charles for all that you do to help people find their voice in our community!